If you are thinking of pre-wiring or rewiring your home network, there are many alternatives to consider. POF (Plastic optical fiber) could be one of your options. It is usually called as “consumer” optic fiber, as it is a low-cost optical fiber alternative with flexibility and ease of end finish. Plastic optic fiber is a large core step-index fiber with a typical diameter of 1 mm, which typically uses PMMA (acrylic), a general-purpose resin as the core material, and fluorinated polymers for the cladding material. It is a specialty fiber has various advantages and is useful for illumination, sensors and low speed short data links and so on. 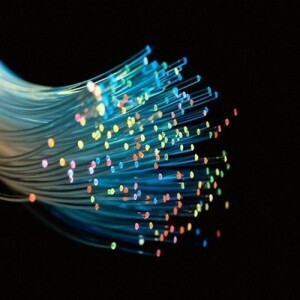 Plastic optical fiber works in the same manner as glass optical fiber but uses plastic instead of glass. Although POF has a higher attenuation than glass optical fiber, it is acceptable for certain applications. Because it has merits that the glass optical fiber does not have. Unlike glass, plastic optical fiber has a larger core made out of PMMA and larger numerical aperture, which is capable of withstanding tighter bend radius than glass optical fiber. Thus it can be easily be cut and bent to fit in hard-to-reach places. Besides, the cost of plastic optical fiber is much lower. POF is Complete immunity to electromagnetic interference (EIM). POF is an electrical insulator, which can be laid down in power ducts. POF has lower weight than copper wiring. With the growing demand for high-speed communications over private intranets and the internet, varied applications with plastic optical fiber have been developed and commercialized. Plastic optical fibers can be used as light transmission guide in displays or as sensors and telecommunications cables. The uses of POF can be found in but not limited to the following fields: FTTH, automotive, medical, intelligence, lighting, sensor, digital audio and video interfaces. If you are looking for plastic optical fiber for cabling, Fiberstore will satisfy your needs. It provides both simplex plastic optical fiber and duplex plastic optical fiber. For more information about Fiberstore’s POF products, you can visit its online store by clicking the following words: plastic optical fiber.